August 1, 2007 : Sunny ant Hot, Water Temp 87* and Clear. Picked clients up at High Point and went and caught Herring. Searched 35' flats and set up on one but only caught Cats and the Stripers were hitting short. Searched for an hour more only seeing broke up fish when John called saying he located a nice school and was catching fish. He didn't have to twist my arm too far and shortly we were on the 40' channel bend with 8 downlines down and going off. We worked the school for only a short time before we lost them so I picked up and looked for them . After looking all around in the area I located them again on a ledge and set up on them again. This time we had no mercy and put 24 in the Boat. By 11am the fish simply turned off and were not interested in eating and we were completely out of bait so we called it a day. 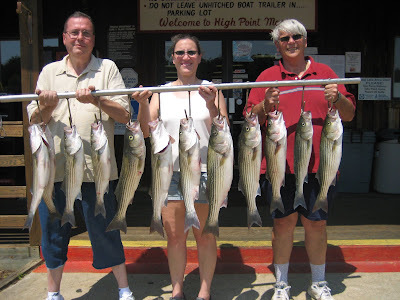 Pictured are my clients with some of the Stripers we caught today. 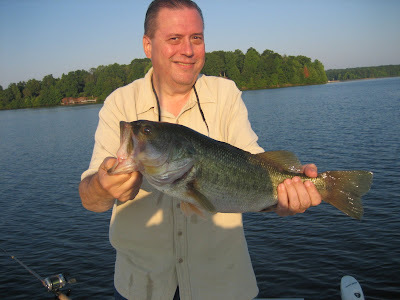 Also Bob is showing a nice Bass we caught on a deep ledge. Thanks go out to John for putting us on the fish.